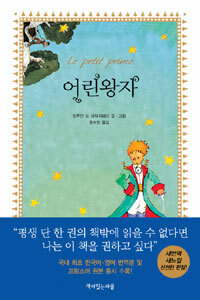 >>>This book is written in Korean, English & French . Antoine de Saint-Exupéry first published The Little Prince in 1943, only a year before his Lockheed P-38 vanished over the Mediterranean during a reconnaissance mission. More than a half century later, this fable of love and loneliness has lost none of its power. The narrator is a downed pilot in the Sahara Desert, frantically trying to repair his wrecked plane. His efforts are interrupted one day by the apparition of a little, well, prince, who asks him to draw a sheep. "In the face of an overpowering mystery, you don't dare disobey," the narrator recalls. "Absurd as it seemed, a thousand miles from all inhabited regions and in danger of death, I took a scrap of paper and a pen out of my pocket." And so begins their dialogue, which stretches the narrator's imagination in all sorts of surprising, childlike directions.